Posted March 19, 2019 & filed under Control Panels. When you have a fire alarm system set up inside of a commercial property, it’s a good idea to tie it all together with a reliable control panel. More specifically, it’s a good idea to do it with a control panel made by Simplex. 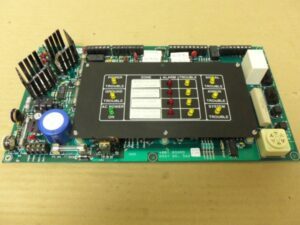 Simplex is one of the industry leaders when it comes to manufacturing control panels and other fire alarm system parts. Here are a few benefits that you’ll get to enjoy with Simplex control panels. As their name would suggest, Simplex control panels are some of the easiest control panels to install in a commercial property. Whether you have a conventional, addressable, or hybrid alarm system, it’ll be simple for you to hook a Simplex control panel up to it. In most cases, you can even use existing wiring to put your Simplex control panel into place. They come jam-packed with features. Each individual Simplex control panel contains any number of great features. Generally speaking, you can find features like internet connectivity, touchscreen technology, and more crammed into the average Simplex control panel. Simplex produces control panels that take full advantage of all the latest technology to make it easier than ever for you to control and monitor your fire alarm system. They can self-test and alert you to problems. Many business owners don’t have the time to worry about testing their fire alarm systems on a regular basis. Simplex control panels take most testing out of the equation by self-testing all the time to see if there are any problems within a fire alarm system. This ensures that your system will be prepared if you ever need it to spring into action. If you don’t have a Simplex control panel set up in your commercial property already, Life Safety Consultants can speak with you about how easy it is to do it. We carry a wide range of Simplex fire alarm parts for those with Simplex fire alarm systems. Call us at 888-557-0558 today to order the parts you need for your system.